Permsub Village is located on Soi Siam Country Club. It is a mature village with communal swimming pool, 24 hour security, playground and easy access to shops, restaurants and schools. 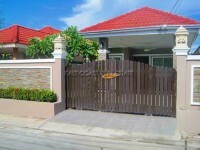 The home has 2 good sized bedrooms, 2 bathrooms, dining area, Euro style kitchen, living room and utility room. There is full A/C and the home comes furnished as the pictures show. Internet and cable TV is available but will be charged above the rental price. The land area is 63 Wah and the home in excess of 150 metres. It is currently held in Thai company name so no need for taxes and transfer costs just change directors. For long term only with the minimum term being 1 year.